Hello, and a very happy Monday to you. Today I have my final Clearly Besotted Stamps Teaser Time card to share with you! 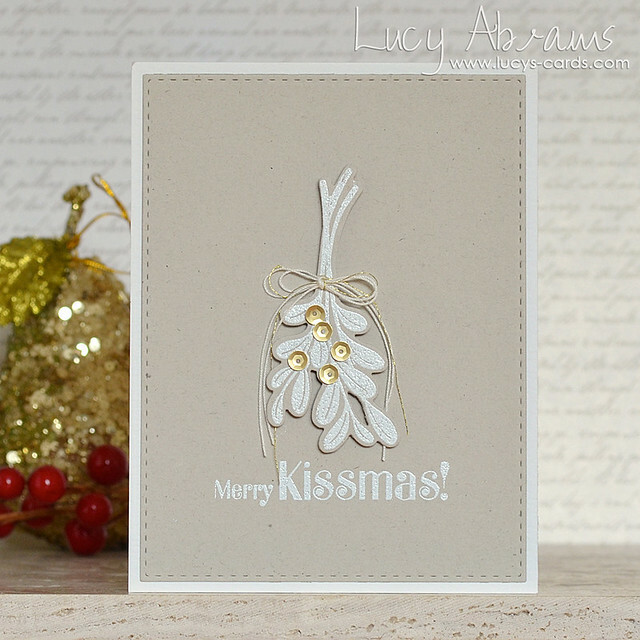 And for my final card I am sneaking a peek at the Merry Kissmas stamp set and matching dies. 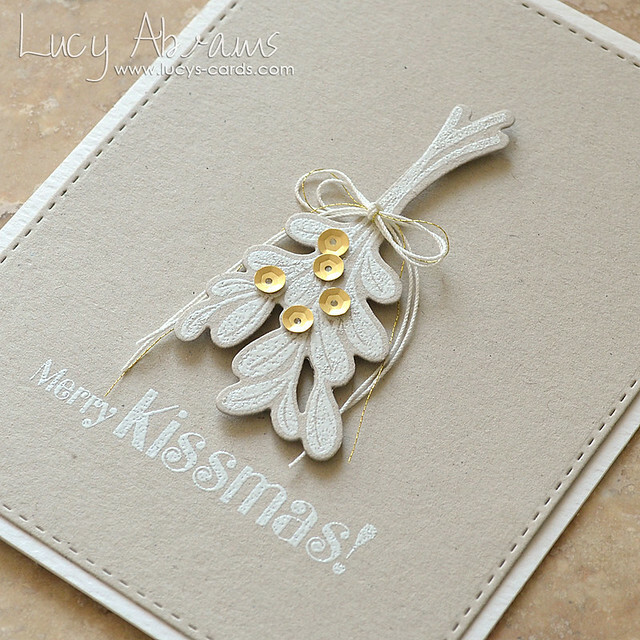 To make my card, I first stamped and white embossed the lovely mistletoe on some recycled cardstock, then die cut with the matching die. I added some matt gold sequins and threads, then adhered it with foam tape to a die cut panel of matching card. The sentiment is also from the Merry Kissmas set. Well, that's all from me for this Teaser Time, but be sure to check out what the rest of the DT have made - they are awesome. You can find all the links on Stephanie's blog. I will be back again soon… until then, have a fab day. It's so beautifully simple and effective. I'm very tempted by them all. The sneak peaks have been so fabulous! So pretty and elegant. Love it! Your card is so beautiful. Such a lovely elegant design and colour scheme. So pretty, love your addition of the sequins! Sweet! I have been looking for a background die that size, perfect! LOVE the simplicity of this card. It's so elegant and beautiful. Beautiful card and that is a wonderful sentiment. Great CAS design and good choice of colours, the stamped image just shines! Beautiful! Love the white on craft, combined with the gold sequins gives a delicate and elegant look. How stunning is this! I love the simple color combination of kraft, white and gold - it truly pops! The white and kraft lend such wonderful class and sophistication to your card! WOW! What a very pretty card. The white on kraft looks great. WOW!!! so clean, so simple, so elegant, so beautiful=perfect! Beautiful card!! Love the embossing.. looks great on the kraft background! So delightful and elegant! Love the embossing!